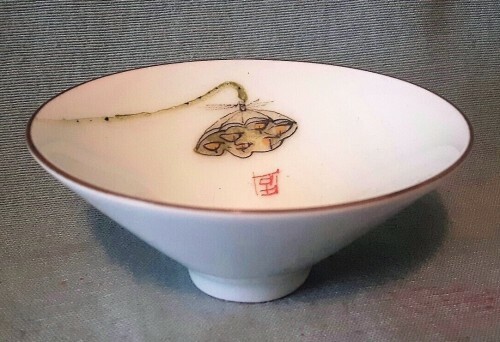 Can anyone identify the artist of this tea bowl? Thank you! David. The bowl looks more like Japanese ware than Chinese to me, but I'll give it a shot anyway. 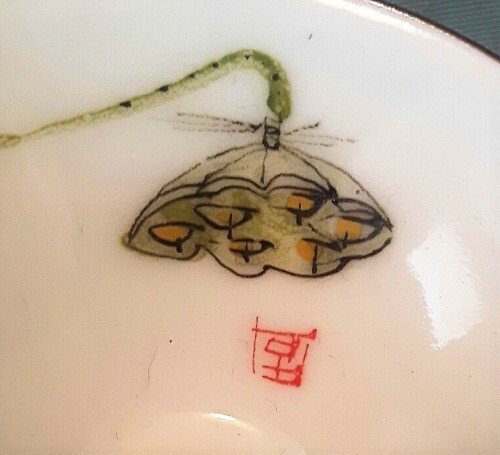 If the character is read from the perspective of someone looking into the bowl from the side with the lotus painting, the mark might then be read by the onlooker as 固 (possibly 'katai' in Japanese or 'gu' in Mandarin), meaning 'strength' and 'toughness'. I'm unsure if it is an artist's name, but in any event, it would be an appropriate description for the lotus pod depicted in the cavetto. The seeds in such pods are known for surviving long monsoonal dry seasons in much of Asia, then when rains return, sprouting up through thick marshland muck as soon-to-bloom lotuses. Moreover, the microscopically ciliated surface of the lotus petals and pads shed the marsh muck in a seemingly miraculous manner when hit by raindrops, helping to make the emergent pristine lotus a Buddhist symbol of life's cycle by reincarnation.